Greeks. It all starts with Greece, of course. Osborne notes how the classic Greek plays flourished for just a generation or two, after the advent of writing and during the period when literate Greece still responded to the beat of oral culture and took their religion seriously enough that the epic themes reworked so creatively by the great playwrights still resonated with the audience. Then writing and rationalism eroded that tension and the creative window closed. Herodotus was an echo of the oral culture — he included all sorts of vignettes designed to keep the audience entertained as he read passages from his History. Thucydides typified the hardheaded rationalism of the next generation, whose work was to be read, not performed. Just the facts, ma'am, and they're not necessarily pretty. From the bibliography, I picked John Keegan's The History of Warfare (1993) and actually read it in parallel with Osborne's book. Nice match. It explains the difference between primitive and modern warfare, and the role the Greeks played in that transition. But that's another story. Romans. Here's the secret: When you think of Rome, the key term is military state. Rome developed the world's first truly professional army and perfected the art of heavy infantry battle tactics they borrowed from the Greeks. After Carthage was eliminated, there was simply no one left standing who could match them on the field for centuries. But the cost to Rome was having to endure a thoroughly militarized culture and state. Her Caesars were all soldiers. There's something deeply flawed with a culture whose finest statesman and intellectual (Cicero) was forced to commit suicide because of politics. Nero kicked his beloved wife to death, then grieved for years. And here's a freebie (not from the book): When the "barbarians" overran the Western Empire, crop yields went up. In simple terms, the greatness of Rome was military and administrative, sort of a USSR that lasted centuries rather than decades. But in many ways it was just organized and bureaucratized thuggery. There's a whole chapter on Augustine, who might be the best thinker that the Roman world produced. From the bibliograhy, try Keith Hopkins' A World Full of Gods: The Strange Triumph of Christianity (1999), which takes an unconventional but entertaining approach to the subject of religious diversity and sensibility in the Roman world. Italy. The updated material on the pre-Renaissance city states of Northern Italy was new (to me) and interesting. The cities had negotiated and fought their way free of political entanglements with the Holy Roman Emporer (across the Alps in Germany), so for hundreds of years they flourished without central control. Competiton by social classes within the cities and economically and militarily between the cities themselves was fierce. It was, in some ways, a replay of the balanced struggle between Greek city states. The Renaissance was more than just art. Remember it was the Italians that invented banking and accounting. The book to read on the new understanding of all this is Lisa Jardine's Worldly Goods: A New History of the Renaissance (1996). Europe. As the Romans followed the Greeks, so a militarized world of centralized European states followed Italy. The precipitating event was Charles VIII of France marchng through Italy with his newly perfected artillery. City walls that had withstood seiges for months and years suddenly fell in less than a day. After that, the trick for any ruler who wanted to remain in power was to get enough central authority to bring in enough tax revenue to be able to buy artillery, pay a professional army, and invest in permanent fortifications to defend the borders of a defined territory. Welcome to early modern Europe, introduced by its ambassador, Machiavelli. It really was a new world — the success of the upstart Dutch cities against a powerful but ineffective Hapsburg overlord is the best indicator of that. Everything Else. Must abbreviate a bit. Second half of the book: The French Revolution unleashed a truly rationalized state that subordinated everything to state power, effectively projected by Napoleon. Then 19th-century Europe continued that trend, which in the end resulted in the cultural train wreck called World War I. In the wake of two European civil wars (WWI and WWII) and the hitherto unimaginable carnage of industrial war, Europe went into eclipse and the rest of the world asserted first its political independence ... and then? The world is changing as we speak. I can feel it in the earth; I can smell it in the air. The global marketplace is here; the global village is just around the corner. Who can guess what the world will look like politically and culturally in a hundred years? Three hundred years? A few books that jump out from Osborne's discussion of the topics in the second half of the book: Religion and the Decline of Magic (1971) by Keith Thomas (I really must find a copy of this book! ); The Great War and Modern Memory (1975) by Paul Fussell; Evil in Modern Thought: An Alternative History of Philosophy (2002) by Susan Neiman; and Dietrich Bonhoeffer's Letters and Papers From Prison (1953, published posthumously). "It all starts with Greece"
Dave, this book would lose me right there. Bill, I deleted your mistaken link. 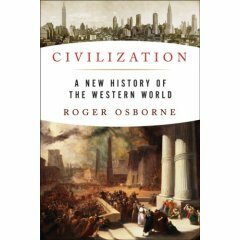 Here are links to a couple of other reviews of Osborne's book: a complimentary one at the International Herald; and a critical one at a website called Culture Wars. "When the 'barbarians' overran the Western Empire, crop yields went up." Could you give source on this? Everything I've read says otherwise. Adam, I just remember it from reading economic history. The "barbarians" were actually pretty good farmers. It's not like people starved when the Empire fell. At least in western Europe, I've always read that there was a large, longterm decline in population. There's other evidence out there, too. The Fall of Rome by Ward Perkins which presents quite a bit of evidence that the end of the Empire was not just the end of a particular military and administrative structure. Though, come to think of it, not much that he discusses actually goes to the comparative efficiency of farming methods, except for the comparison of cattle skeletons (Roman cattle appear to have been better fed, meatier animals than post-Roman cattle). Around 643 the Slavic moldboard plow made its way into Europe. That was some time after the Roman Empire fell, so hard to attribute to the fall. I think agriculture did decline for that first century and a half after the empire fell, then improved with the new technology. Exactly when did the empire fall? And did it all fall at once? And it was that increase in population allowed the Germanic tribes to overwhelm the Roman frontiers and legions, then displace Roman rulers. By the time they displaced the Romans, of course, most of them were already Christians.